"A few years ago Jon Biehler took a life-changing bicycle ride through the US state of Maine. He happened upon a school – the Shelter Institute – which would eventually transform him from a teacher into an architect and builder, the sort of man able to put a roof over his own head. . . . Biehler and many others have discovered, taking a self-building course not only improves your project’s bottom line. It can improve your life too." Join us for the Design Build Class in July and Improve your life too! As if any of us really need an incentive to purchase a Tormek T-7 Sharpening System! Tormek is now offering a free Gransfors Hand Axe (valued at $105) with the purchase of a T-7 between May 1, and July 31, 2009. This is a pretty spectacular combination of tools -- two of our favorites! We've got the Tormek T-7 in stock. you simply register your Tormek at http://www.tormek.com/ and type "Free Gransfors Axe" in the comments section and you will get a special form to complete and mail along with a copy of your receipt to the address indicated. Claims must be received by their office no later than August 15, 2009. Receipts must be dated between May 1 and July 31, 2009. Now you can take a hands-on drafting-on-computer class. While we have always offered drafting with pencil and paper in our Design-Build Class, we know that many of you have stopped using pencils and paper and we don't want that to be an excuse for not creating a thorough design. Although Pat will always draw his projects by hand, many of you have asked about our favorite computer programs. Although there are a myriad of choices out there with a wide range of price tags attached to them, we thought we would start with a cost effective version. 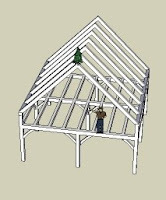 The instructor, Patrick Wright, is a self-taught Sketchup artist who has experience as a teacher, homeowner/builder, land use planner, and Timber Framer with the Hennin Post and Beam Crew. In 2007, he led a group of novice volunteer modelers who created 45 buildings in Downtown Brunswick, ME. These models have been accepted in Google Earth's "3D Buildings" layer. Patrick's practical building experience helps to bring together the realities of home design and construction with the expertise of computer aided design. Students should bring a laptop computer to gain the most from the workshop but it is not required. If possible, please download Sketchup ahead of time at: Google Sketchup If you have trouble installing the program, the instructor will help you at the beginning of class (please arrive early). Be sure to bring a mouse, as a touchpad is much more difficult to model with. Join us for a FREE one hour discussion of composting toilets: we'll provide first hand experience with a variety of styles, information on how they relate to the building code and how best to use and maintain them. As always a question and answer session will follow in which we can provide information specific to your situation! 'Tis the season for composting with the opening of summer cottages and guest cabins come explore whether this is a good choice for you or not! Free coffee, tea and snacks provided! Shelter Institute supports Maine Public Broadcasting Networks annually by donating one course tuition to the MPBN Great TV Auction. This year you can bid for items online! Check out our class and make a bid and see the other great items up for auction! This year we donated tuition for the One Week Small Housebuilding Class. Cabins, camps, sheds, guest houses, cottages, and tree-houses are all tiny houses. Learn to design and build a small structure to suit your own particular needs in this one-week hands-on seminar. We will design and build a small cabin to serve as a year-round guest house. The size of this particular house will be less than 200 square feet!We address such issues as design (how to make a small space feel big), basic structural engineering, heating and cooling as well as alternative plumbing solutions. Our structure will demonstrate low environmental impact on its surroundings and is designed for minimal maintenance through the years. Learn to use basic hand tools effectively in this class - upon registration, we will provide you with a list of suggested tools. Part of the class will be an introduction to the best tools for the most common tasks. And of course, any tools you do not already own, you can purchase here at Woodbutcher Tools during your stay. A key component of this seminar is our panelized construction technique which allows for efficient, fast construction that is strong and durable. You will learn the tips and tricks to make your own tiny house as permanent and useful as any larger structure.